Joseph Edward Roberts, 73, of Hendersonville, passed away on Saturday, January 12th, 2019. Preceded in death by his parents, Samuel and Fannie Lee Roberts. Survived by his loving wife of 40 years, Mary Jane, children, Todd Smith (Kim) and Russ Smith (Tanya), grandchildren, Miles, Brianna, McKenzie, Savannah, Kayla and Corey, great-grandchildren, Cameron and Ava. Joe is also survived by his special friend and college roommate, Tom Salmon, along with many extended family and friends. Joe was born on January 17th, 1945 in Wichita Falls, Texas. He was a United States Navy veteran, serving on the USS Canberra during the Vietnam War. Joe retired from a career in sales in 2014. Joe was an active member of Goodlettsville Church of Christ where he served as a Deacon and assisted with the church disaster relief program. Joe was also a member of Hendersonville VFW Post 9851 and VVA Chapter 240, where he served as secretary for 14 years. He also assisted his fellow veterans during the display of the Vietnam Veterans Moving Wall display while in Hendersonville. Joe enjoyed remote control cars and trucks and watching the Dallas Cowboys and Tennessee Titans. He was an avid reader and enjoyed all types of music especially country, gospel and Neil Diamond. Joe was a loving family man who liked telling jokes and taking trips to Gatlinburg. Joe will be dearly missed not only by his family but also by the veteran community in Hendersonville. Joe was always willing to help a fellow veteran in need and was involved with veteran events in the community. A Celebration of Life service will be held at Hendersonville Funeral Home on Wednesday, January 16th at 12:00PM, officiated by Brother Charles Baugh. Visitation will be held on Tuesday evening, January 15th, from 4:00PM-8:00PM and again two hours prior to the service on Wednesday. Burial will take place following the service at Hendersonville Memory Gardens in the Field of Honor with Navy military honors. Family and friends will serve as Pallbearers. 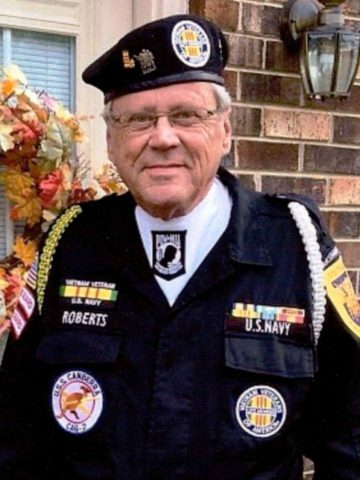 Honorary Pallbearers will include elders and deacons from Goodlettsville Church of Christ, members of Hendersonville VFW Post 9851, VVA Chapter 240 and good friend and neighbor, Aubrey “Footsie” Murphy. In lieu of flowers memorial donations in Joe’s name can be made to VVA Chapter 240, c/o VFW Post 9851, 73R New Shackle Island Road, Hendersonville, TN 37075. Regular and faith church member. Had lots of interesting stories about the Vietnam war. Always has a positive attitude. Very interesting person. Always had good comments about the Bible and other religious subjects. Mary Jane and family, So saddened to read of Joe’s passing. He was always kind and pleasant. You are all in my thoughts and prayers. One of the most encouraging upbeat positive men i have ever met. Joe always had a smile, a joke to cheer you up. Truly faithful man of God. He will be greatly missed. Mr. Joe was a pleasant man, highly respected, wonderful kind individual. He will be greatly missed, my condolences to Mary Jane,Thank You For Every Thing you Two did for my grandchildren. It was always a pleasure to talk to Mr. Joe especially about Texas.